The Panait family, which owns the Red Angus steakhouse and The Beef Club fine dining restaurant in Bucharest, plans to expand to the Romanian seaside city of Constanta, Romania-Insider.com has learned. They are working on a historic building which will host a boutique hotel and a restaurant, Dragos Panait (in opening pic), executive director of Operative Steakhouse Group, which owns Red Angus and The Beef Club, told Romania-Insider.com. Panait hopes to open the restaurant in about three months, and to take advantage of the booming business in the city, by attracting business people, including those with activities in the Constanta Port. 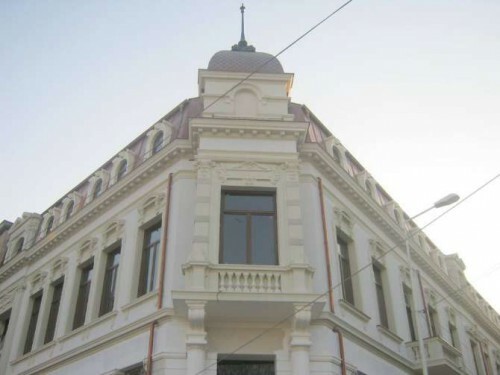 After having bought the historic Hrisicos House in Constanta’s Ovidiu Square in 2007, the Panait family started renovating it. The house, more than 100 years old, already had its façade renovated by the new owners. Work has reached the structural phase for the future 23-roomed boutique hotel, whose opening date has not yet been planned. For the restaurant, however, which will have some 70 seats, a similar size to The Beef Club in Bucharest, Dragos Panait plans a late – summer opening. “We are not targeting seasonal tourists, but rather business people,” he told Romania-Insider.com. The restaurant, whose name has not yet been decided, will follow a similar concept as The Beef Club in Bucharest, opened in February this year. Additionally, it will also include a cigar club and a wine cellar at the basement. Panait did not disclose how much the family business invested in acquiring or renovating the historic house in Constanta, nor how much the restaurant would require in further investment. They invested some half a million euros in opening The Beef Club, which is located in a rented space at the ground floor of an office building in the Aviatorilor area of Bucharest. The restaurant serves mainly business clients who work in the several office buildings in the area, a mix of Romanians and foreigners. The Hrisicos House (pictured above) in Constanta was built in 1900 based on the plans of architect L. Givért, and initially served as a hotel and restaurant. During its rich history, the ground floor restaurant saw famous visitors such as Romanian writers Caragiale, Barbu Ştefănescu Delavrancea and Vlahuta. The building owner was Gheorghe Hrisicos, a businessman who defrauded several banks and served time back in the early 20th century. Later, the building hosted several banks, including most recently a BCR branch, just before the renovation under the Panait family’s investment. The Panait family has been running the Red Angus steakhouse in Bucharest's Old Town since 2010, and expanded with its second restaurant, The Beef Club, earlier this year. The Old Town steakhouse underwent renovation and redecoration in 2013, when it re-opened following a EUR 280,000 investment. The new interior design was signed by famous Romanian architect Cristian Corvin.